Sunday Observer) picking the winners on coupon No. 9 in the weekly draw for readers prize. CRICKET: Royal College captain Ramith Rambukwella who had fared impressively at the Royal-Thomian Big Match took the lead from team mate Bhanuka Rajapakse polling 46,037 votes at the end of count number 9 in the Observer/Mobitel Most Popular Schoolboy Cricketer All Island Contest 2011. In the Outstation category, St. Servatius' Sanjika Ridma who took the top spot ahead of Royal Panadura's Dushan Vimukthi last week, was pushed to third place. 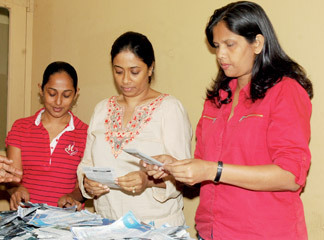 Maris Stella's Chatura Dilshan took the number two spot while Royal Panadura's Dushan Vimukthi was placed first with 18,471 votes.